I will occasionally be using this blog to write little pieces about books and other things that catch my eye, with an emphasis on stuff that has been so far undiscovered or overlooked. As a case in point, this post isn’t just about an undiscovered book but a whole new artists group/publishing operation out of Bologna, Italy called Canicola. They are putting out an eponymous anthology that is getting stronger with every issue. You’ll find a lot of new Italian talent–Andrea Bruno and Giacomo Nanni are particular favorites of mine–and some familiar faces. And then there’s Amanda Vähämäki, whose book Campo di Babá (The Bun Field)is one of Canicola’s first stand-alone efforts. I’m guessing Amanda is Finnish and either lives in Italy or maybe hooked up with the Italians via correspondence [February 07 update: she is indeed Finnish but she lived in Bologna for six years–M], but the book is in Italian with English “subtitles.” This is Canicola’s globalist innovation and I think it’s pretty clever: the English translation appears at the bottom of each page. It’s not an ideal solution but it’s better than tipping in a sheet of paper with the entire script translated, and Canicola utilizes it in their anthology as well. Campo di Babá is a meandering, dreamy narrative drawn in a warm and sketchy pencil style full of visible corrections and smudges. 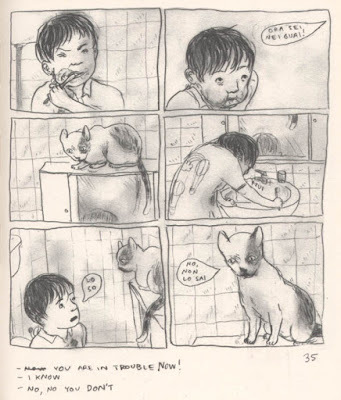 The 54-page comic follows a young tomboy as she wakes from a nightmare and embarks on a strange kind of low-key odyssey full of talking animals, barren landscapes, and a sense of foreboding–even of judgement–that seems to hover nearby her wherever she goes. It’s a cliché to invoke David Lynch when talking about weird and creepy dream narratives, but Campo di Babá shares with his recent films a beguiling sense that meaning is just beyond your grasp, and, more to the point, the narrative has a formal complexity–including a circular ending that is easy to miss on the first read–that I found very satisfying. Look for more presence of Canicola in the US soon, I know they are trying to get US distribution of their work and I am trying to convince them to come to the MoCCA Art Festival this summer. Keep an eye out. Hi Matt. I came here from the Journalista link. thanks for pointing to interesting stuff – there really is a big world of comics out there. The book having English subtitles is something a few finnish comics have been doing for a while now – both the last two Glomp’s for instance – it’s just possible this is reprinted as the original Finnish rather than something the Italian publisher has initiated – good to see tho’. –If you haven’t heard, Canicola (the anthology) won the best fanzine award at Angouleme so congratulations to them. I looked at your subway sketches. Way to go! I’ve been sketching people in my college classes lately for kicks and giggles not to mention its good practice. Nobody even noticed which is what I like. You can see the sketches when you click the sketches link on the right side of my page.